Nothing is cooler -- and at the same time modest -- than a maxi skirt in the summer! 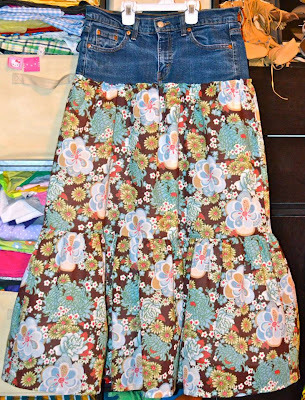 Inspired by this pin, I converted an old pair of holey jeans into a cool, flowy maxi skirt. I added a tiered skirt of cotton voile from Fabric.com with an underskirt of plain bleached muslin. I was careful to pull the front pockets inside out before cutting and sewing so I wouldn't render them useless. I love pockets and wouldn't want to sacrifice them! Similarly, I did not want to cut off the back pockets! So before cutting off the lower portion of the jeans, I picked out the stitching on the lower half of the pockets. After adding the skirt, I re-stitched the pockets down right overtop the voile! It's a detail I'm in love with! It's comfy, cool, and versatile! And feminine! I feel so pretty when I wear it! So happy I found this! I have some tiered fabric I bought at Joanne's a while back (it's actually got multiple like ruffled layers, so a bit different than this), and I had been hoping to make a skirt similar to this but wasn't sure where to start! I will definitely be using this to help m e out.